No hipster messenger bags, tattoos, piercings, or vintage eyeglasses, just straight up riding a bicycle. That's the Pueblo scene. As much as I miss having people around that ride their bicycles, I really don't miss the hipster scene that grabbed a hold of bicycling in the late 90's on the west coast. 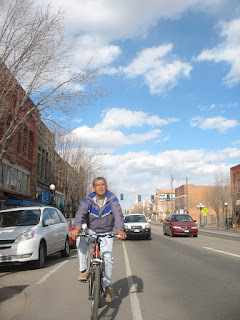 If riding a bicycle does ever catch on in Pueblo, I sure hope it is for the love of riding a bicycle, rather than just as an accessory to some other fashion or social trend. I love riding a bicycle and not just because it looks good on me!!! I also love my piercings, and Jesus loves my tattoos (I have the t-shirt). Those I love because they compliment my outfits. Pueblo is real and I don't think that's going to change anytime soon! Jesus probably loves bicycles, people with piercings and tattoos, t-shirts, and even sweaters. He has to right...He's Jesus?